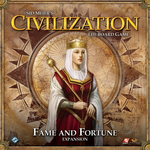 The Fame and Fortune expansion for Sid Meier's Civilization: The Board Game provides players with new game options, and brings a host of enhancements. Four new civilizations: The Arabs, the Spanish, the Greeks, and the Indians. A new deck of "Great Person" cards that allows players to recruit the aid of specific figures from history, such as Joan of Arc, Marco Polo, Hannibal, or Gustavus Adolphus. New map tiles, tech cards, culture event cards, and the introduction of the investment deck, which features cards that allow players to spend hard-earned coin to reap ongoing benefits. Components for a fifth player. With eleven new map tiles, over 150 cards, plus more than 120 markers and tokens, Fame and Fortune offers a remarkable set of engaging new options to guide your people to greatness!